DOCTOR WHO - Remembering UNDERWORLD | Warped Factor - Words in the Key of Geek. For Tony Fyler, the quest is the quest. It’s difficult, on the surface, to understand why Underworld is so generally unloved, always coming in the final chunk of stories any time a fan favourite poll is published. Could it be that the story wears its mythological origins and underpinnings a little too brazenly on its sleeve? Well, yes possibly – The Horns of Nimon often suffers from a similar fate, the sense among fans that the writers haven’t worked hard enough to keep their story’s underskirts from showing. The tale of the immortals, inspired by the gods, looking for their destiny, stolen blatantly from the story of Jason and the Argonauts, even to the names – Jackson for Jason, Herrick for Heracles, Orfe for Orpheus, the P7E for Persephone and so on, and especially the idea of a journey into the Underworld of the title, all feels as though it went from pitch to screen without a great deal of love or care in between. 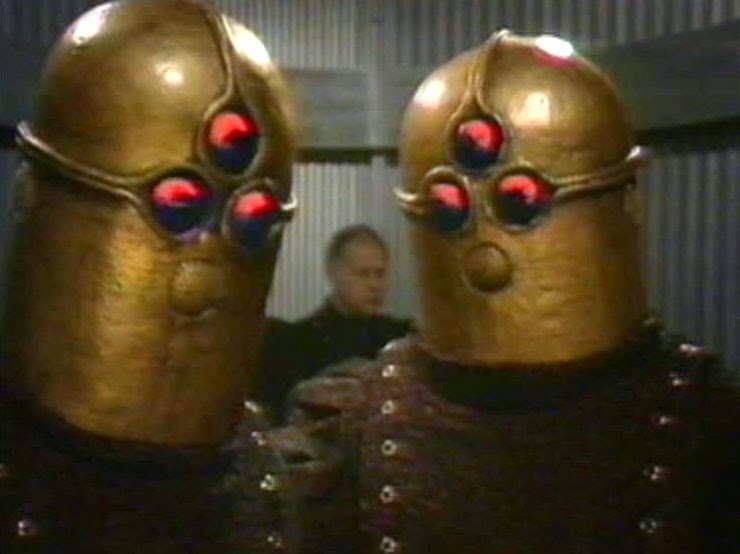 The ‘Bristol Boys’ – Dave Martin and Bob Baker – turned in scripts like that relatively frequently, but in each of them, however unformed or underbaked the concept might have been, there were nuggets of joy – The Three Doctors was a lot of faffing around with gelloids (yes, really), but in the meantime, it gifted the series a chunk of Time Lord history that has become the bedrock for our understanding of the planet for over forty years, and introduced us to one of the founders of Time Lord society in the person of Omega – as well as seeding in the meta-universe the idea that Doctor Who could celebrate its anniversaries with something a bit special. The Mutants was at least a couple of episodes too long and had a sterility in the writing and production that makes it to this day one of the most tedious experiences in Classic Who, but it had a solid anti-racist, anti-imperialist and anti-Apartheid theme – and it had it in the mid-70s, when British TV was still showing The Black And White Minstrel Show and Love Thy Neighbour. The Invisible Enemy, bless it, was a Time Lord re-run of Fantastic Voyage, but almost coincidentally, the story gave us the genius idea that was K9, and so, for all its obvious nickery from Greek myths, there’s another solid chunk of Gallifreyan history built into Underworld that has been easily adopted as part of the planet’s legend ever since – the origins of the doctrine of non-intervention that so bored and infuriated the Doctor that he stole a Tardis and ran away from home to see the universe. 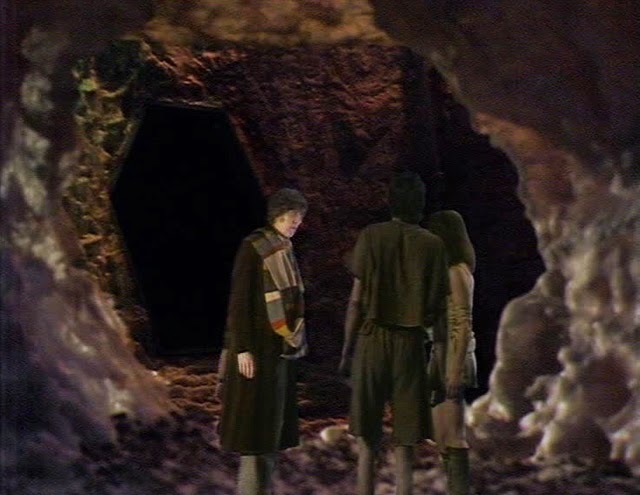 In a lot of ways, Underworld is the pre-origin story of Doctor Who, and might be expected to act as a kind of lesson to the Doctor about his interfering ways. It doesn’t, obviously: this is Tom Baker’s Fourth Doctor we’re talking about, and he’s rarely if ever in doubt of his own dilettante, exploratory path through time and space, righting what he sees as wrongs, but still – were it not for the Time Lords acting like gods with the Minyans, not only would Jackson and his crew not have spent a hundred thousand years looking for their race banks on board the P7E, and not only would the inhabitants of the Underworld been made to suffer in darkness for pretty much as long, but Time Lord society itself would never have become the strictly non-interventionist thing it did, and the Doctor would never have run away from Gallifrey. Given that we’ve seen in at least two Eleventh Doctor series finales the consequences for the universe if that chain of events hadn’t taken place – worlds not saved, dictatorships not overthrown, the universe itself not saved from total heat death and the like, the gift to the canon that Underworld gives should put it beyond the hatred and calumny of fans for all time. That’s clearly not going to happen though. Quite apart from the severe referencing of the Jason myth that makes up the core of the storyline, there are those production values. Those design choices. The general sense that as well as being produced on a shoestring, it was written with the expectation that the audience’s imaginations ran on shoestrings too. The fact that once we get beyond the relatively reasonable, well-paced first episode there’s so much CSO, and so little of it actually works, is probably a key issue in terms of fans’ disdain. Wobbly sets are one thing. Sets which disappear as actors walk through them is quite another. It’s on record that Underworld was an experiment for using CSO techniques as a replacement for studio sets and even some location shooting. On the one hand then, it’s probably just as well that the idea didn’t work anything like as well as was hoped. But on the other, it does leave Underworld looking like little enough else in the canon of Who to make it stand out – and not in a good way. Then there are the costumes. In many cases – particularly on Underworld itself - it’s as though the costume department literally threw some monochrome rags on the characters, sewing shiny metal rings in here or there for supposedly menacing faces on what are basically balaclava helmets. Overall, the production values on Underworld rather strive to convince the viewer that there are no production values on Underworld. 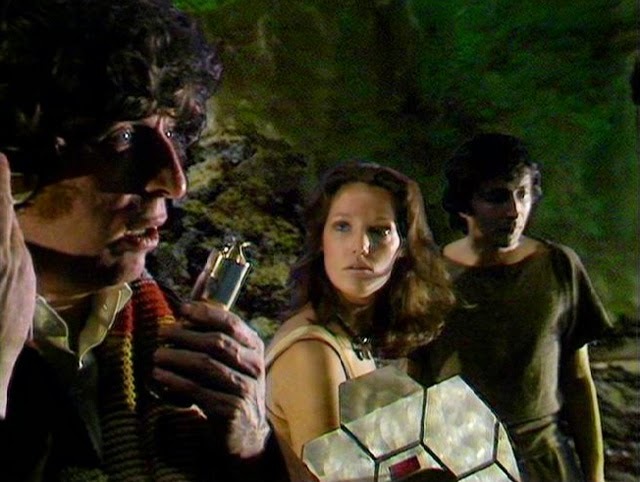 For all that, there are two stand-out performances in the story – Tom Baker and Louise Jameson as the Fourth Doctor and Leela, here feeling much more united as friends than in previous stories. It’s only when you watch the beginning of Underworld that you realise quite how rare shots of the Fourth Doctor actually flying the Tardis are, and also, how good at them Tom Baker really was, given that rarity. Check out Louise Jameson doing superb sulky savage teenager acting when she’s ‘pacified’ as if by a Justin Bieber poster, and when the Doctor brings her round from her sop-fest – ‘You’re laughing at me. You’re all laughing at me. I’ll smash your stupid smirks off your stupid faces…’ – absolutely joyous. The dialogue between the Doctor and Leela throughout the course of Underworld shows that while the Bristol Boys had a talent for core ideas, and historical padding that added immeasurably to the canon, it’s actually in characterization that their truest skills really lay. If you can overlook the faintly obvious storyline, the ludicrous costumes and the gorblimey overuse of CSO to within an inch of the audience’s patience, Underworld can be good fun as a masterclass in carrying on regardless (the quest for the actors is clearly the quest to keep taking things seriously against the bluescreen 70s nothing of their environment), and in the development of the relationship between the Doctor and Leela as it heads towards its denouement in The Invasion of Time. Perversely enough of course, in the Oracle, the Doctor is again triumphant against another computer with ideas above its station, enslaving the humanoids in its care and setting them against each other – a dilemma familiar to Leela from her home world under the schizophrenic rule of Xoanon In Face of Evil. There are very few senses in which Underworld is classic Doctor Who. 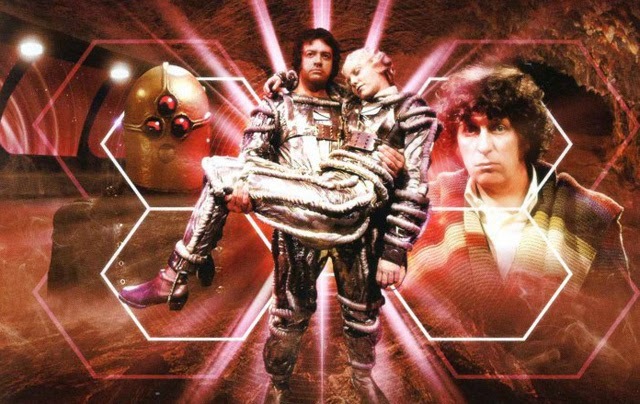 But in one of the best Doctors, and one of the best realised companions, both working at the very height of their powers even against all the odds of experimental production techniques and exhausted budgets, it deserves a re-watch on its anniversary (38 years old today, first broadcast January 7th 1978). Settle in and go beneath the surface, to find the real pleasures of Underworld in the layered performances of its leads.